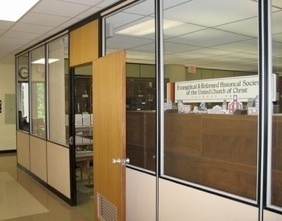 Founded in 1863 as the Historical Society of the German Reformed Church, the Evangelical and Reformed Historical Society was established in 1934 when the Reformed Church in the United States merged with the Evangelical Synod of North America. 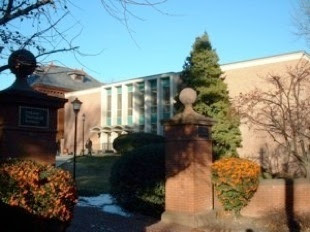 The Society is housed on the 2nd floor of the Philip Schaff Library at the Lancaster Theological Seminary. A vast collection of historical holdings from affiliated churches around the country includes minutes of Boards & classes; liturgies, publications, and congregational records from the 1700's to present. A treasure trove of resources & helpful assistance for researchers. Henry Stutzman was never forefront in our congregation. He never served on the Consistory, taught a Sunday School class, or sang in the choir. But Henry took great care of the Lord's House as our custodian from 1938 to 1945. Henry was small in physical stature, softspoken with a slight German accent; a gentle spirit with a sweet smile. Brought to America as an infant, he was born in Baden, Germany. Rolls first show Mr. & Mrs. Henry (Mary) Stutzman as members in 1926. Although he was a foundry worker, he & his wife tithed generously. Mary died in 1932. On January 1, 1938, Henry Stutzman became our custodian, and the church literally became his home. His "apartment" consisted of a cot-sized bed, a small radio on a little table, and a comfortable chair in the furnace room area. His little bit of cooking was done in the church kitchen. It was assumed the galvanized tub hanging on the wall of the furnace room doubled as his bathtub and sink, for he and his clothes were always clean and neat. His "apartment" was cool in the summer and warm in winter, where Henry was always there to stoke the old coal furnace. Besides sweeping, dusting, scrubbing and general cleaning, Henry planted flowers around the church and parsonage in the spring. And shoveled snow in the winter. He was perfectly content taking care of God's House. His annual salary was $90. Rev. Paul Graeser and his family lived in the parsonage next door, along with other church members in the neighborhood. Often they would cook "extra" for dinner, then invited Henry. Being a shy man, he would usually politely decline their offers. Taking the left-overs back to his place, Henry preferred eating alone. The children adored Henry and were thrilled watching him ring the church bell. He would pull the rope, then hang on as it lifted him high off the floor. The children laughed...and so did Henry! Henry worked until his death on February 14, 1945. He was 63. With tears in his eyes, Rev. Graeser officiated the funeral which was held in the church that Henry loved. Henry Stutzman rests peacefully in Memorial Park Cemetery. Sunday School at First E&R Church has always been a stronghold of learning about the Good Book. 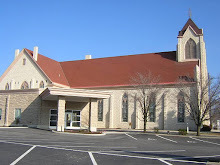 On August 7, 1873 the German Reformed Church was host to a district Sunday School Festival, with six German Sunday schools of Allen County and several English schools participating. Approximately 1000 people paraded to the old fairgrounds on Bellefontaine Avenue where they enjoyed a picnic, before returning downtown for a concert at the City Hall located on Main & High Streets. During the Pastorate of Rev. C. Pluess, the Sunday School flourished under the leadership of Superintendent Jacob Moser. 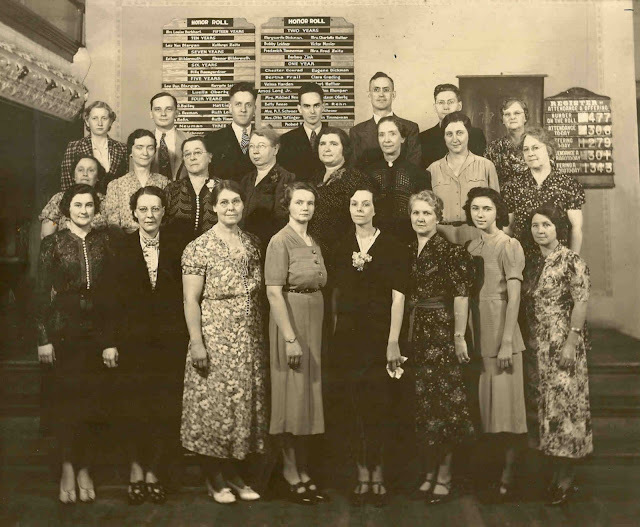 See below a photo of the Sunday School Cabinet (Officers & Teachers) circa early 1930's, under the Pastorate of Rev. Reuben J. Schroer. Clarence Frey, Sr., George Urich, Mrs. Mary Perry.